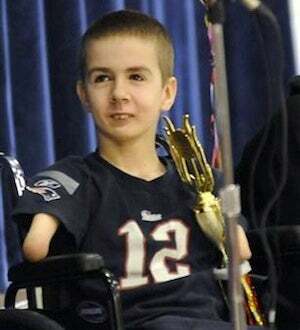 This week 10-year-old Nicholas Maxim of Maine, who was born without hands and lower arms, received a special award at a national penmanship contest. Maxim writes by holding a pen between his arms, and judges were so impressed that they created a new award in his name for students with disabilities. He received the award at a school assembly, which was a surprise because teachers hadn't told him that they entered his paper. "We submitted his entry because we felt his penmanship was amazing considering he completes most of his work without using his prostheses," said Principal Cheryl Hasenfus.